Surf boards, swimsuits, sand and Suzukis, what more could one ask for? Zunami was held at Kure Beach, located near Wilmington, NC. August 2nd-4th, 2002. 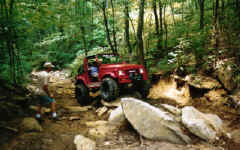 This event was held by R/T Gray and Waneta Ellis. There were a total of 27 people, 2 dogs and approximately 15 vehicles. The first wave of Suzukis started arriving on Friday. This included Rob and Melissa Feehley with The Chewman, Mike and Pam Nagle, Derek Schwab, Ken and Karen Earles, Chris Loyd, David Johnson, and our gracious host, Roy, Waneta and Peanut. Sandpipers Subs was the unanimous choice for dinner. Cruising the beach and sitting around a lantern, telling zook stories finished out the night. Normally it would have been a campfire, but due to the temperature, a fire was out of the question. 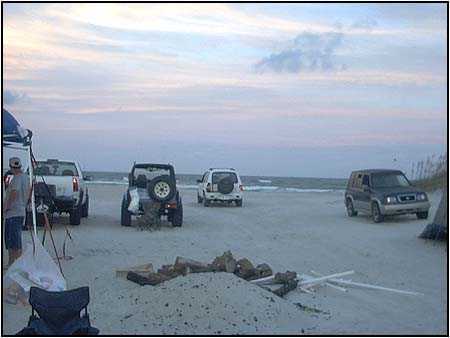 As the sun came up Saturday morning, 4 wheel drive vehicles began to line the edge of the beach. 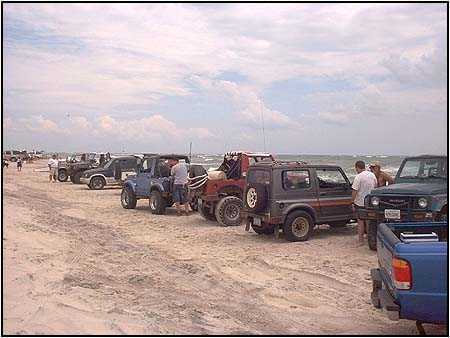 By the early afternoon, the beach line was made up entirely of 4wd vehicles that were having to park 2 deep. As the tide rose all afternoon, the vehicles mocked the approaching shoreline. 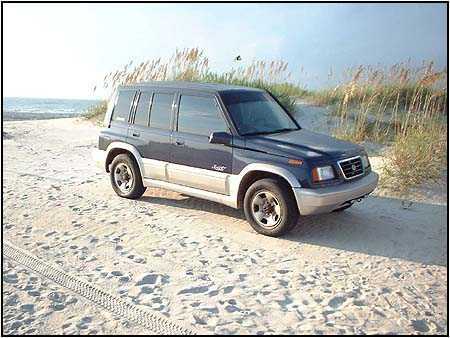 The Suzukis claimed their spot on the beach and had a blast. Peanut and the Chewman were busy fetching and burying balls and chasing the water. The early morning hours brought beautiful clear water and calm waves. As the afternoon progressed, the waves grew and provided some great surfing. We were surrounded by sailboarders and kite boarders doing all sorts of tricks, and lets not forget about the bikinis walking up and down the beach. Shall we say the American flag was quite beautifully displayed that day? There were several beach rides that afternoon. The Suzukis filed down the beach and played in and out of the ruts in the sand that grew as the day progressed. The beach came to a point where the bay started. We drove around the point and along the bay. The trail then winds through the grassy sand dunes and eventually released us back on to the beach. Between riding on the beach and body surfing, everyone relaxed on the beach, soaking up the sun and talking shop. Hoods were constantly up with crowds inspecting engine bays and people bent down peeking at each others suspensions and running gear. Ideas and imaginations were going wild. Several people made guest appearances that afternoon including Todd and Heather Dowless, Grady and Pop Gray, Justin and Donna Fender, Sam and Sara Blanton, Jeff and Frankie Young, and lets not forget Tom and Ben Weirs. We camped in the sand dunes about 300 feet from the ocean. That evening Chef R/T and Rob grilled hamburgers and hot dogs while Sam and Sara Blanton prepared 2 gallons of baked beans. After this clam bake we took a ride into town and had ice cream at the infamous Squigleys. If you are ever at Kure beach, you have to stop here for some ice cream. As we returned to the beach, the wind started blowing hard and the sand dunes that we thought would provide protection actually acted like wind tunnels. Little did we know that there was a storm starting to brew off the coast. All of a sudden we started feeling the raindrops. Some of us started putting our rain covers on the tents. Unfortunately with the strong winds, they acted like a parachute and were starting to lift the tents out of the sand. 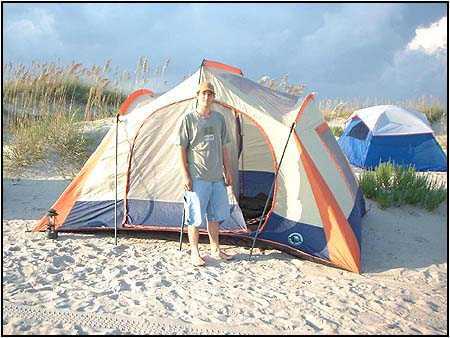 Mike and Pam were able to move their tent to safety, but some of the larger condo tents had to stay put and take the beating. Luckily the rain stopped as quickly as it began, but the wind was not as nice. It felt like you were being sand blasted. 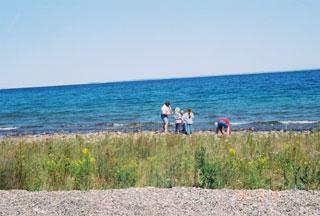 Not wanting to be sandblasted, a group of us went out on the beach to see what the receding water line had left. In the ebbing tide we found several things including a crab, a jellyfish and several shells. We came across hundreds of sand fleas and clams buried in the sand. We returned to the campsite and by this time it was almost unbearable in the sand dunes. Most people went to bed while a few sat around the lantern and talked. The wind blew all night and I can only imagine that this is what it would be like in a tent on the Himalayan Mountains with a heated tent. The wind attacked the tent throughout the night like a boxer training on a punching bag. The sand was so fine that it came into the tents through the screened vents. 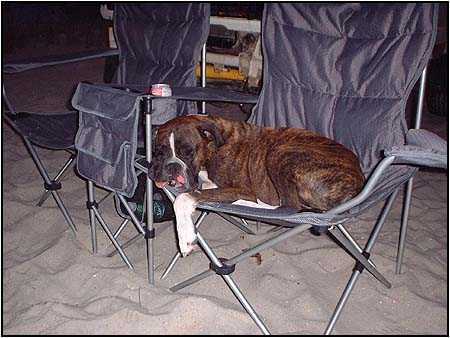 I awoke that morning to find everything in the tent, including me, covered in sand. Chris was the only person lucky enough to get up and actually see the sunrise. As the rest of us finally woke up, we all noticed the huge black clouds looming off the coast. We all immediately started packing up and headed off the beach. No sooner than the last vehicle got off the beach, the rain came. Some people headed home and the rest of us went to eat. After eating, some of us checked out some of the local shops and a civil war museum and Fort Fisher. Zunami was a great event. It was nice to be surrounded by zooks in the relaxing atmosphere of the beach. Its nice to get away for a weekend and actually get to relax. Special thanks to R/T, Waneta, and everyone else that made Zunami possible. Zunami is definitely an event that you need to mark on the calendar and attend.